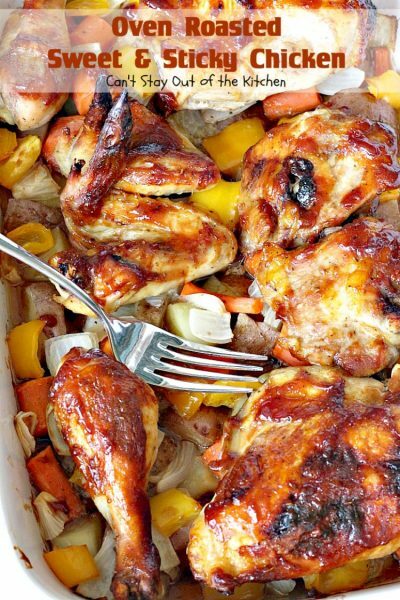 Oven Roasted Sweet and Sticky Chicken is another delightful one-dish chicken entree. You know my penchant for easy one-dish meals. They’re usually a lot healthier and less calories than pasta dishes or our favorite Tex-Mex entrees. (Even though we love all of those kinds of foods). 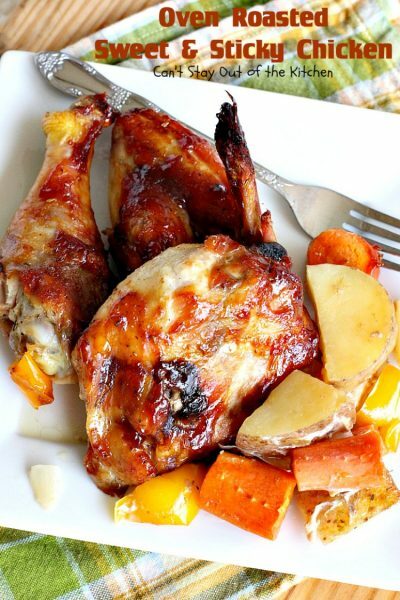 This chicken dish consists of basted chicken over top of potatoes and carrots. It’s really delicious. It’s also gluten free. Back in August we had a friend whose sister passed away. Even though it was somewhat expected it was still a very difficult time. I offered to bring them a meal, but his wife has Celiac Disease so I was very careful to make a gluten free dessert and meal for them. I came across this recipe and decided to give it a try. 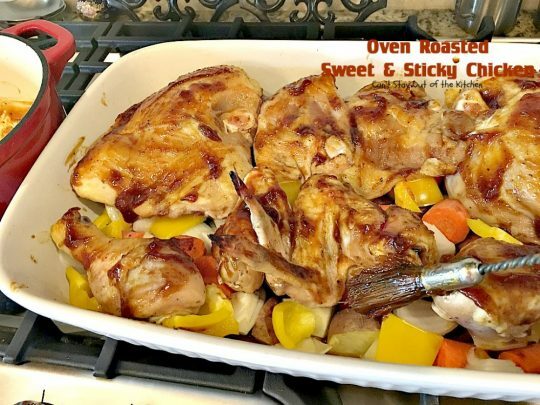 I loved the sweet and sticky glaze and thought it was a great idea to add onions and green bell peppers to the potatoes and carrots on the bottom of the dish. While the original recipe called for removing the chicken if it was cooked and allowing the veggies to cook longer, my veggies were ready when the chicken was. All in all, I thought it was a very good recipe and one worth making over and over again. 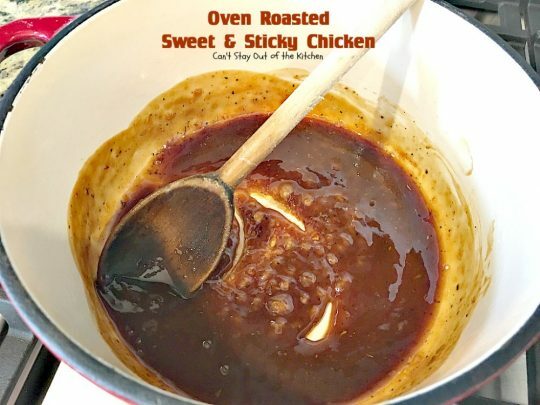 I especially liked the sweet and sticky sauce made from ketchup (without HFCS or preservatives), maple syrup, honey, molasses and seasonings to amp up the flavor. It had an excellent taste. If you’re in a pinch, and want to make a delicious one-dish meal for your family but you’re tired of your usual offerings, I highly recommend Oven Roasted Sweet and Sticky Chicken. 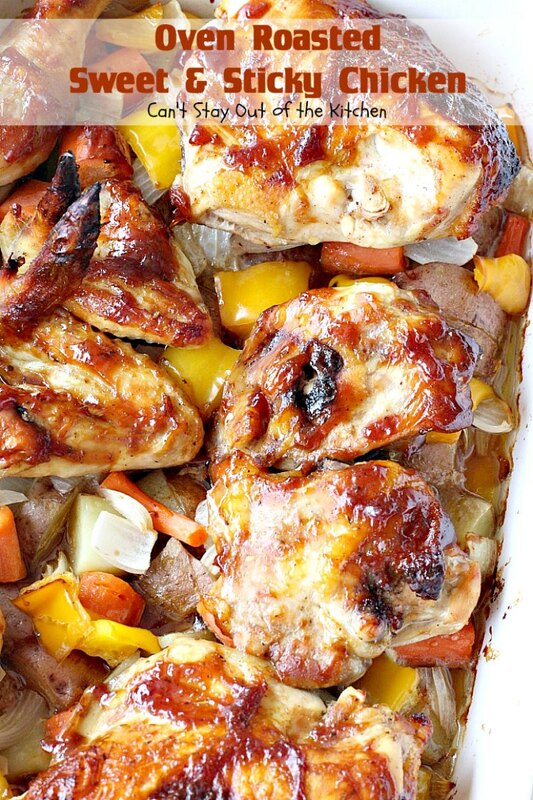 It’s a great new take on chicken that you’re sure to find savory and delicious. 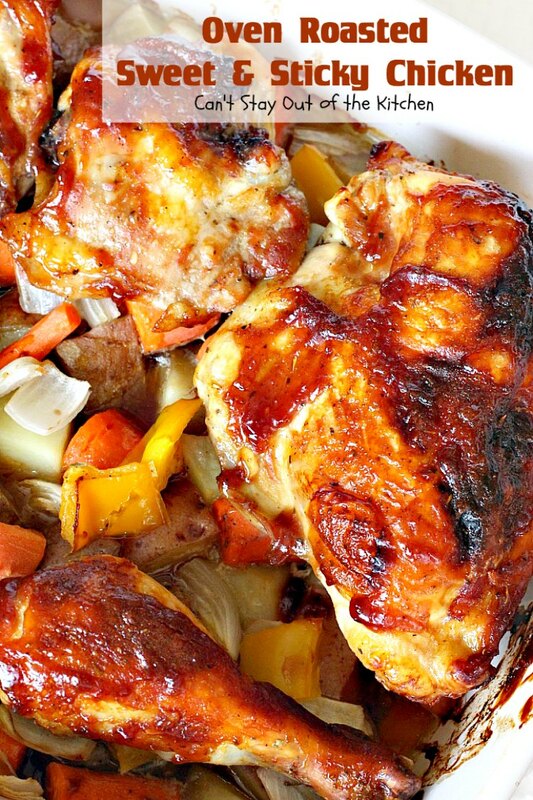 Oven Roasted Sweet and Sticky Chicken makes for a delicious one-dish meal. 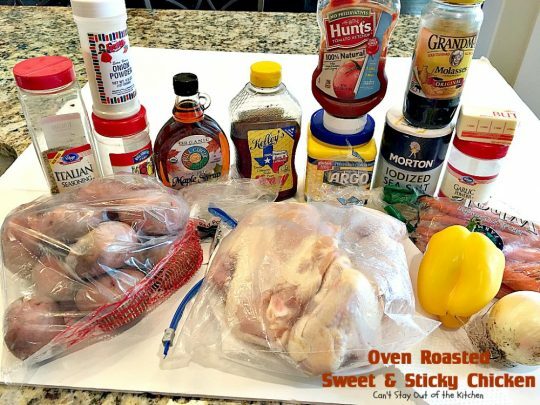 While I used a whole chicken cut-up, you can use boneless, skinless chicken breasts or thighs, if you prefer. 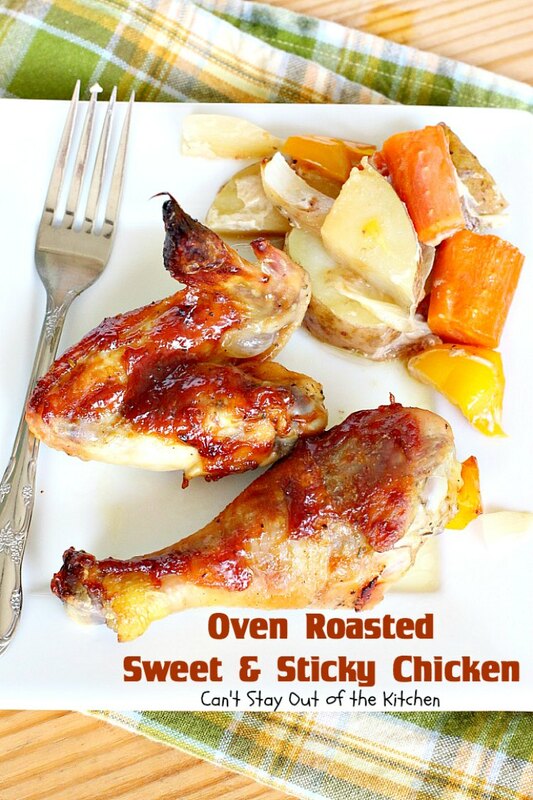 Oven Roasted Sweet and Sticky Chicken is healthy, low calorie and gluten free. First, make the sauce: Place molasses, honey, maple syrup, ketchup and seasonings in a mixing bowl. Stir to combine. Place chicken pieces in a separate bowl. Add 1/4 cup of sauce ingredients and stir to combine. Grease a 10×17″ glass baking dish. Place cut-up veggies on the bottom of the dish. Top with chicken pieces, then add slivers of butter. Drizzle any remaining sauce from the chicken bowl (NOT the main sauce bowl), over top of the chicken. Bake at 350 for 25-30 minutes. Meanwhile, place remaining sauce ingredients in a saucepan and bring to a boil. Add cornstarch mixed with water and stir to combine. Heat through. Remove from heat and set aside. After 30 minutes remove chicken from oven and baste again with thickened sweet and sticky sauce. Bake an additional 30 minutes or until chicken and veggies both test done. My chicken and veggies were both cooked through at the same time. If necessary, remove chicken and keep warm and allow veggies to continue cooking in oven until fork tender. The Sweet and Sticky Sauce is superb. This one uses maple syrup, honey, molasses and ketchup along with several seasonings. I was careful to use a ketchup without HFCS, MSG or other preservatives to keep this recipe as clean as possible. The flavors in this main dish casserole are exceptionally good. You will find every bite of Oven Roasted Sweet and Sticky Chicken delightful. This amazing chicken entree is a great option for a one-dish meal. Casserole contains chicken basted with a sweet and sticky sauce over top of red potatoes, carrots, bell peppers and onions. Gluten free. Spray a 10x17” glass baking dish with olive oil cooking spray. Layer potatoes, carrots, bell pepper and onions on the bottom of the baking dish. Combine ketchup, molasses, honey, maple syrup and seasonings in a small bowl. 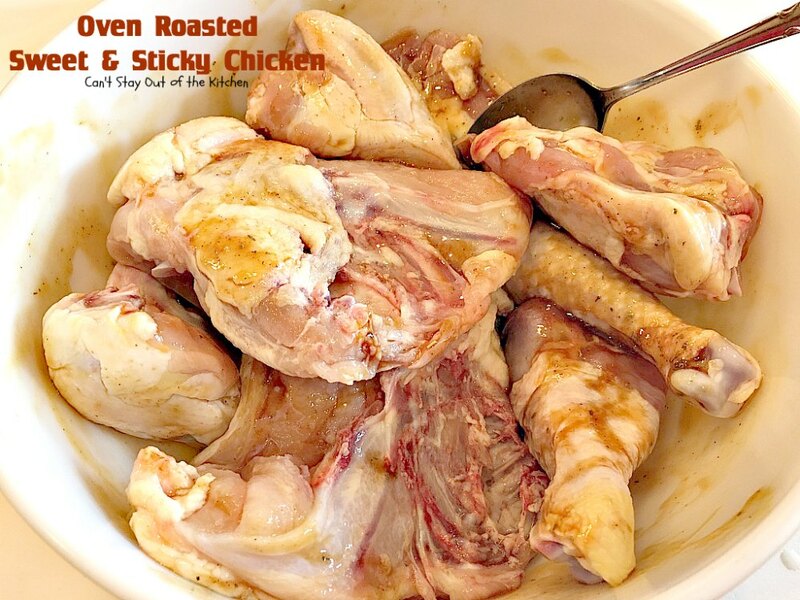 Place chicken pieces in a separate large mixing bowl. Measure out ¼ cup sauce and drizzle over top of the chicken pieces. 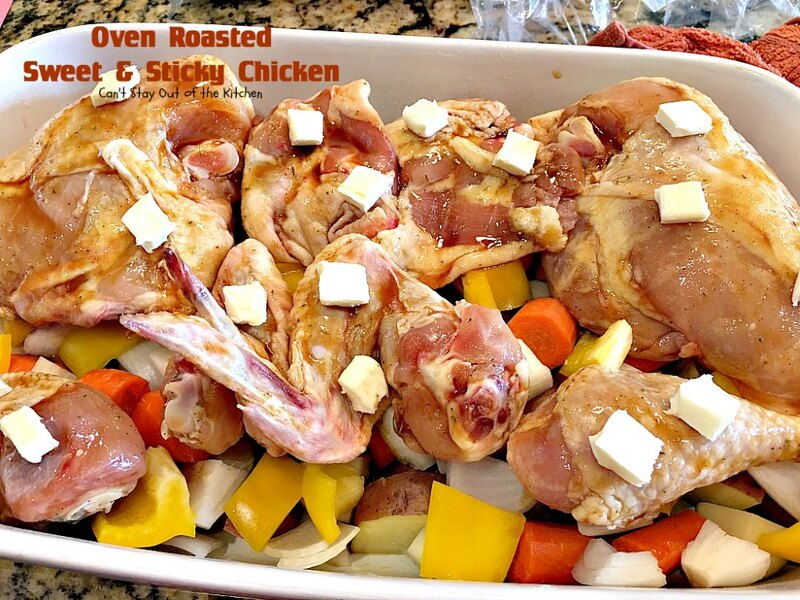 Place chicken pieces over top of veggies in baking dish. 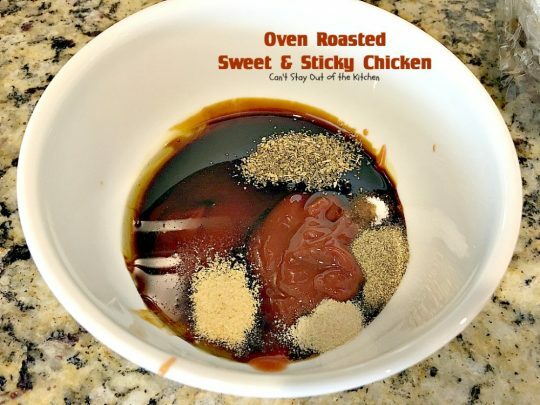 Drizzle any remaining sauce from the chicken bowl (NOT the regular sauce ingredients) over top of the chicken pieces. Meanwhile, pour remaining sauce ingredients into a small saucepan. Heat over low to medium heat until mixture begins to simmer. Heat over low to medium heat until mixture begins to simmer. 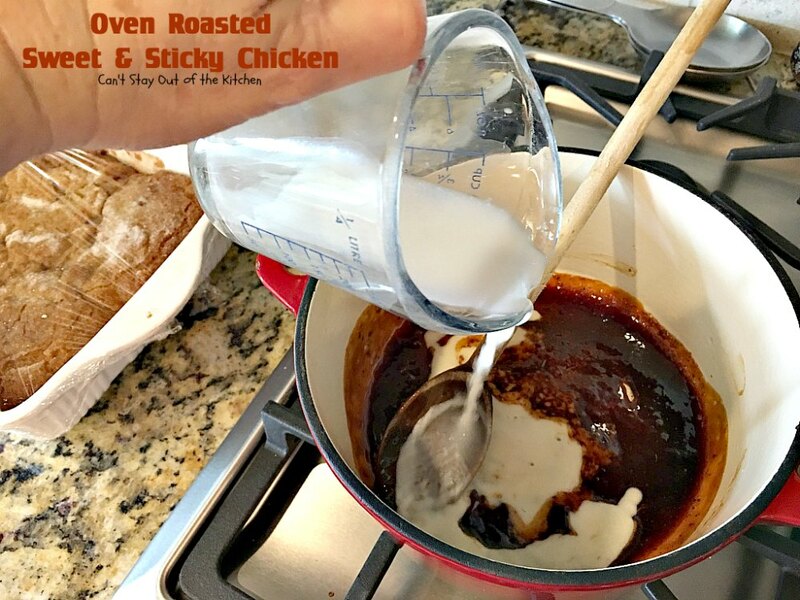 Combine cornstarch and water and add to sauce mixture until mixture thickens and heats through. Baste sauce mixture over top of chicken pieces. 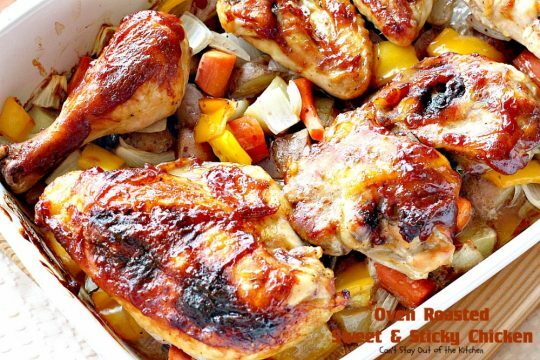 Bake an additional 25-30 minutes or until chicken is cooked through. NOTE: If necessary, remove chicken and keep warm and allow veggies to continue cooking in oven until fork tender. Recipe adapted from Don't Waste the Crumbs. 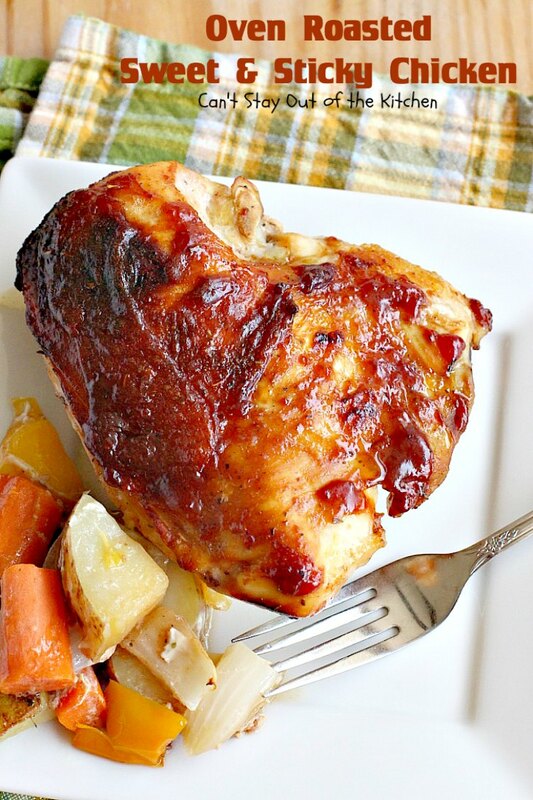 This savory chicken entree will have you licking your fingers! 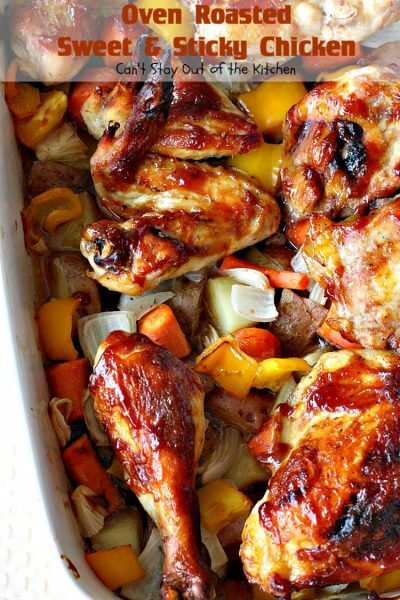 Oven Roasted Sweet and Sticky Chicken is a great recipe if you’re aiming for a one-dish meal.